NASA's LCROSS mission in 2009 confirmed what had long been expected. 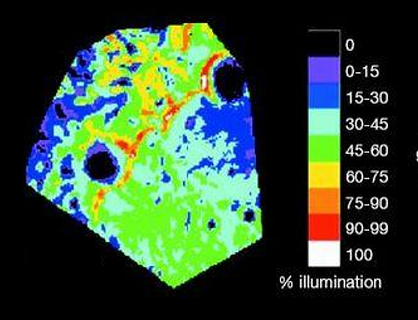 There are locations on the Moon with significant percentages of water ice. This changes everything. Since the axis of the Moon isn't tilted all that much (about 1.5 degrees) compared to its orbit around the sun there are some craters at its north and south poles that have floors which the sunlight never reaches. It was long speculated at ice at the bottom of these permanently-shadowed craters might contain ice from long ago. The bottom of these craters are not warmed by the sun except for the reflection of sunlight on their rims. They are warmed only by the minimal heat from the stars and from the internal heat of the Moon. Temperatures at the bottom of these craters can reach as low 25 Kelvin which is close to absolute zero. However, the rims of these craters and certain ridges near the poles have nearly permanently sunlit areas where the sun seems to skim along the surface of the Moon nearly continuously. Put together, there are specific locations at the lunar poles where nearly permanent sunlight is located only a short distance from a permanently-shadowed floor with the possible ice. 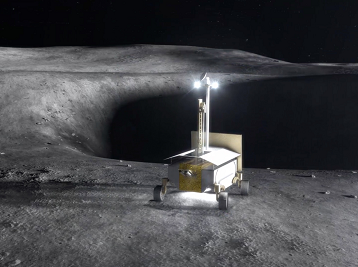 Operations could link these two locations such that solar power systems on the rim could power telerobotic, ice-harvesting operations on the floor. There are several different approaches to linking these two locations including a wire, power beaming, telerobots driving the distance, residual propellant for ice-harvesting operations, etc. 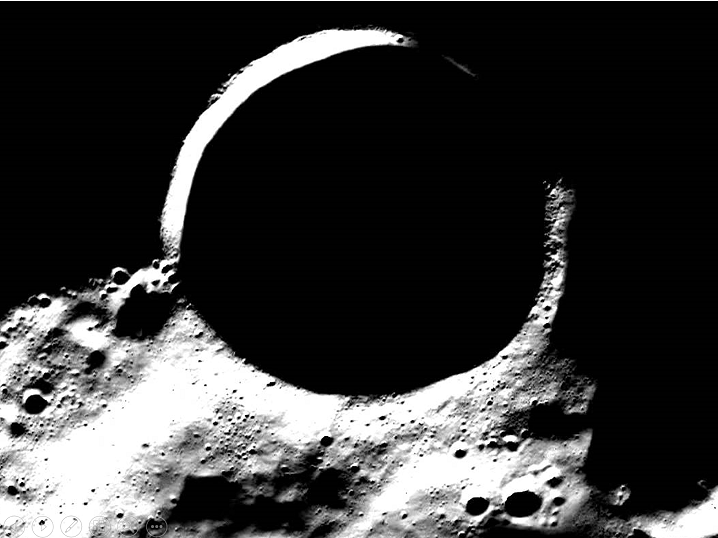 In 2009, NASA conducted an ingenious, low-cost mission in which a Centaur upper stage was intentionally crashed into one of these permanently-shadowed craters. In the process, some of the icy lunar dirt (regolith) was kicked up into the sunlight. A trailing satellite imaged the kick-up dirt and found that it had water ice in about one part per 18 (i.e. 5.6%) along with various other chemicals including organics containing carbon and nitrogen. What are the implications? Well, water can obviously be used by crew to drink and for sanitation. It can also be used for growing plants for food, clothing, etc. But most importantly initially, the water can be electrolyzed into its constituent components (hydrogen and oxygen) which is the most efficient form of chemical propellant possible. Indeed, propellant represents a large majority of the mass of a rocket upon launch from Earth. So, having a fueling station on the Moon would dramatically reduce the cost of access to and all over the Moon. However, one point needs to be made clear, whereas water ice on the Moon is extremely valuable, we should not consider it to be on the critical path to either the Moon or Mars. Rather it should be considered to be a "value-added" resource that makes things better but which isn't essential. If it turns out that water ice on the Moon cannot be harvested economically* does this mean that we an our international partners would therefore have no interest in going to the Moon? Certainly not. 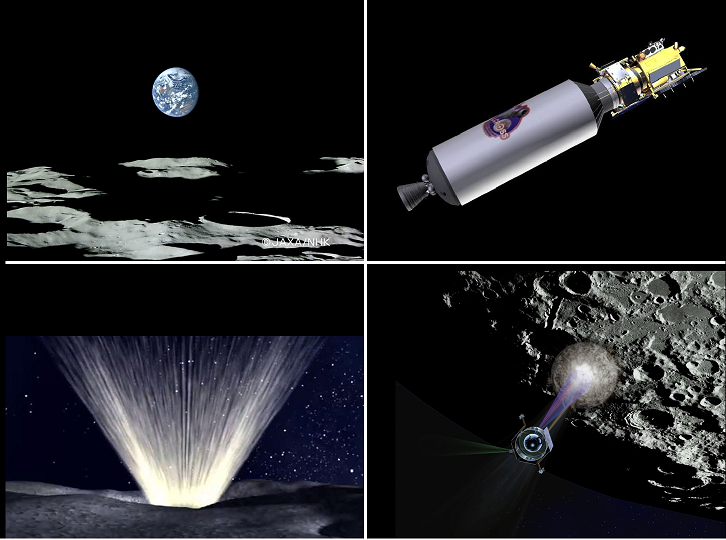 So, instead of waiting until a series of small landers thoroughly prospects for lunar ice, we should start now with the development of a full-sized lunar, habitation systems, and crew training while simultaneously conducting the small prospecting missions. Data from various sources indicate that there is about 600 million metric tons of water ice at the poles of the Moon, perhaps more. 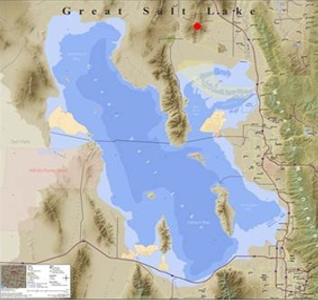 This is as much water as that contained in the Great Salt Lake. With good recycling, each person requires about a kilogram of water and other volatiles a day. So, a million residents could survive over 1,600 years before running out of the lunar ice. This would give far more than enough time to develop other sources of water such as comets or asteroids. In other words, the Moon has sufficient water to start a large civilization. Therefore, the Moon is a legitimate destination for development, exploration, and long-term settlement.